Opened in 2002, Wychwood Park is home to one of the best young courses in England. Despite its relative youth, the course has already been made a regular host for the European Tour’s Qualifying School, with many critics touting this as a future Tour venue. Wychwood Park’s fantastic golf course is ably supported by the 108-room hotel, complete with an award-winning restaurant and The Claret Jug bar. Situated just five minutes from the M6, the resort can be easily accessed by golfers from across the UK. Book a Last Minute Deal at Wychwood Park now from £85.00pp! 1 in 12 goes free between 1st November 2018 and 31st October 2019! We found 3 offers matching your search. Wychwood Park is generally regarded as one of the premier inland courses in the north of England. At 7,213 yards from the championship markers, the course is set up to host professional tournaments and undoubtedly will challenge the game's best. This is however a resort course, and as such has an array of tees, ensuring that all golfers can enjoy a round at Wychwood. The construction of the golf course utilised the latest in technology, including a computerised system for irrigation, while the teeing areas and sweeping greens were constructed in line with USGA principles. The majority of visitors to Wychwood leave in awe of the course’s brilliant design. There are no weak holes: each has its own character and challenge – particularly the par 3s, many of which would look at home on some of great golf courses in the country. There are numerous obstacles and hazards to be negotiated en-route here, not least the constant threat of water. 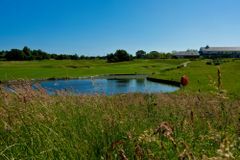 Wychwood Park is an extremely adaptable golf course, making it very attractive as a golf break destination for players of all standards. There are a number of terrific and unique holes at Wychwood Park, but the 17th is certainly the most beautiful. Don’t be fooled by the elevated tee box, which can make the hole appear shorter than it is, as a full carry of almost 200 yards is needed to clear the water from the back pegs. This is a gorgeous golf hole that will evoke memories of the 16th at Augusta National. Located just 5 minutes from Junction 16 on the M6, Wychwood Park enjoys an enviable setting with scenic views over the Cheshire countryside in a location accessible to both the north and south. While the golf course at Wychwood Park may the attraction for many visitors, the hotel itself should not be underestimated; the 108 bedrooms are spacious and bright, and furnished to a high standard. The hotel is contemporary and stylish, with all the facilities and amenities to ensure that golfers and families are extremely well catered for. In addition, the dedicated staff members are always on hand to assist with any requests you may have. The award-winning Steam, Bake and Grill restaurant serves mouth-watering cuisine in a lively evening atmosphere. There is a wide variety of dishes to choose from in the dinner inclusive menu: the rolled pork belly with sautéed pancetta, basil mash and red wine jus comes highly recommended. Unwind after a long day on the fairways in the appropriately named The Claret Jug bar, where you can grab a cold beer and watch live sport on the big screen. For breakfast, help yourself to the all-you-can-eat buffet featuring all your hot and cold morning favourites. One thing is for certain – you won’t go hungry on the golf course. Room was clean bed was zip and link so a topper would of improved the bed. It was nice having a bath and shower in the room. Had a very enjoyable first round of golf on the first day . Staff in pro shop very friendly and helpful. Unfortunately on the second day most of the greens on the back 9 holes of the course were out of use due to maintenance work . Q - What time is check-in and check-out times? Q - What time is breakfast? Q - What is the dress code for dinner? Q - Is there a range on site? Q - Are there buggies available to hire? Q - How much is the fee for the caddies? Q - How many bars are there? Q - Is there BT or Sky Sports in the communal area? Q - Is there a charge for car parking on site?